This powerful slogan encapsulates a community-focused, service-minded law enforcement agency found deep in the heart of Forsyth County. One of the major contributors to the NC LETR, WSPD officers regularly organize and participate in fundraisers that raise valuable funds and awareness for Special Olympics NC. In one of their unique events, local police officers compete against doctors from the Wake Forest Baptist Medical Center in their annual “Cops vs. Docs” Hockey Game. All proceeds from this event benefit Special Olympics athletes in North Carolina. Taking fundraising from the ice to the table, the officers also participate in Tip-A-Cop fundraisers at local restaurants. Officers team up with the restaurant staff to serve customers and collect tips to benefit Special Olympics Forsyth County. But officers don’t stop there! They even take their support to new depths by going freezin’ for a reason every year. 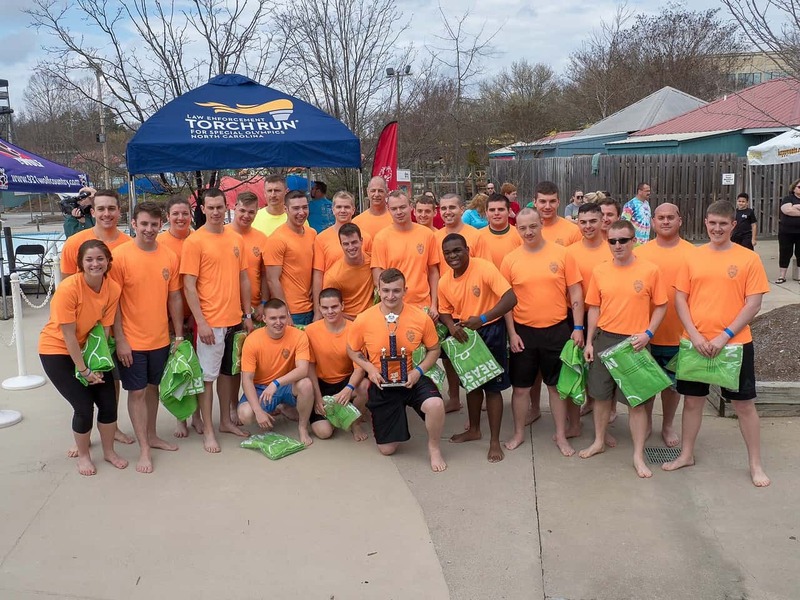 Leading up to the 2018 Triad Chill Polar Plunge, WSPD had an interdepartmental competition to see who could raise the most money. Each district competed against one another and the members of the Basic Law Enforcement Training Class walked away the champions! Together, WSPD raised nearly $8,000 during this fun competition. But by far, WSPD officers have a favorite SONC volunteer role: Guardians of the Flame. At their local spring games and state-level events, WSPD officers help carry the Flame of Hope into the Opening Ceremony and they are regularly seen engaging with the Special Olympics Forsyth County local program. Several Winston-Salem police officers serve as Games Management Team volunteers, as coaches and as event volunteers. No matter how many fun and challenging fundraising events WSPD may come up with, the reason behind each one is always the same. “Every day the athletes inspire me to do more and continue to be involved,” shares Morgan. Among many favorite memories, she vividly remembers an athlete telling her at an event with tears in his eyes that it was “the best day of his life.” As a coach and active volunteer, moments like this make all the difference to Morgan. 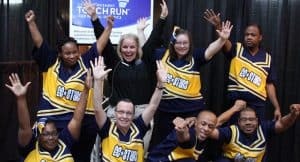 The Winston-Salem Police Department and their involvement with the North Carolina Law Enforcement Torch Run for Special Olympics ignites hope and creates a sense of community in the Winston-Salem area. Going above and beyond the call of duty is normal for these officers and their department and because of this, they have emerged as leaders in the Special Olympics movement!